Aeroflot has begun ticket sales for flights to Palma de Mallorca, the capital of the Spanish island of Mallorca. Regular flights on the Moscow – Palma de Mallorca – Moscow route will be launched on June 1, 2019. – flight SU2518 will depart Moscow on Saturdays and Sundays at 7:55, on Tuesdays and Fridays at 12:15. – flight SU2519 will depart Palma de Mallorca on Saturdays and Sundays at 12:35, on Tuesdays and Fridays at 17:15 (local time). Aeroflot is continuously expanding its route network and increasing flight frequencies to popular destinations. Aeroflot flies to 152 destinations in 55 countries, including 54 in Russia. In its Winter 2018/19 schedule Aeroflot has launched 14 new destinations, which will be serviced both by the Company’s own fleet and by Rossiya Airline. Aeroflot’s route network spans the largest cities in the Northern Caucasus, including Grozny, Vladikavkaz, Makhachkala, Nazran (Magas) and Nalchik, as well as the cities of the Volga region – Izhevsk and Ulyanovsk. On top of that, Aeroflot has launched direct flights from Moscow to Osh and Bukhara. On the international front Aeroflot added flights to three European cities: Gothenburg, Dublin and Ljubljana, as well as flights to Denpasar – the largest city of the Indonesian island of Bali – and Colombo – the largest metropolis of Sri Lanka. 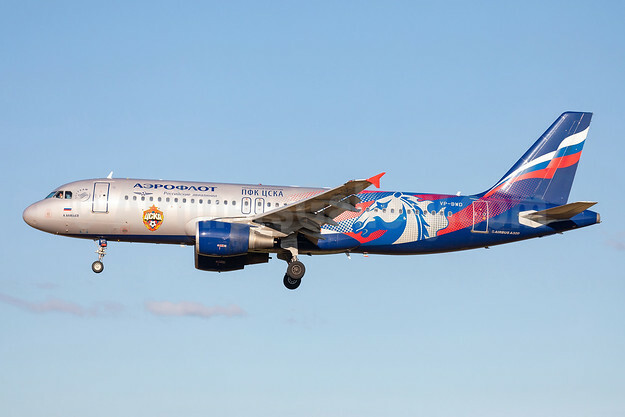 Top Copyright Photo (all others by Aeroflot): Aeroflot Russian Airlines Airbus A320-214 VP-BWD (msn 2116) (CSKA Moscow Football Club) ARN (Stefan Sjogren). Image: 942358. This entry was posted in Aeroflot Russian Airlines and tagged Aeroflot, Aeroflot Russian Airlines, Airbus A320-214, CSKA Moscow Football Club, msn 2116, VP-BWD on December 28, 2018 by Bruce Drum.